The C.S.S. Georgia, one of the few ironclads commissioned by the Confederate Navy during the Civil War, was unique for her time. Construction of the ship was funded by a women’s organization which grew out of “gunboat mania” in the South. Though she never fired a shot and many considered her a failure, the C.S.S. Georgia was able to protect Savannah from U.S. invasion from her location in the Savannah River from 1863 until 1864. She was scuttled as General Sherman’s army approached the city, and her wreck remained largely undisturbed for decades. Despite some damage from dredging operations in the late twentieth century, the C.S.S. Georgia remains one of only five identified Confederate ironclad in existence. 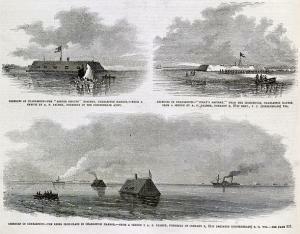 “Defences [sic] of Charleston,” Frank Leslie’s Illustrated, Feb. 7, 1863. From the Library of Congress Prints and Photographs Division, Illus. in AP2.L52 1863 (Case Y) [P&P]. From the beginning of the war, Confederate leaders had warned coastal southern towns to guard their coastlines from U.S. attack and they feared the consequences of the U.S. blockade. In response to this fear, the Confederate navy began to experiment with a new technology: ironclad ships. Unlike traditional wooden warships, ironclads had a very low profile, angled sides, and were covered in a protective layer of iron. After the ironclad C.S.S. Virginia sunk two Union warships, damaged a third, killed 300 soldiers, and wounded 100 in a five hour battle on March 8, 1862, “gunboat mania” swept through the South. The victory of the C.S.S. Virginia gave the Confederate Navy hope that they could accomplish their goals of protecting their coastline and breaking the blockade with the use of ironclads. Though they lacked materials, shipbuilding facilities, and skilled labor, the Confederacy was able to construct twenty-two ironclads during the war. In the midst of “gunboat mania,” many southern women saw an opportunity to aid the war effort in a much more active way than by nursing the sick and injured or sewing bandages and uniforms. Fearing for the safety of their coastal and riverfront towns, these women organized Ladies’ Gunboat Societies to gather funds for and to construct new ironclad ships. Though many of these groups had male leadership or direction, female involvement in such a public philanthropy effort went beyond traditional gender roles. They utilized state newspapers to compel citizens to contribute to their gunboat campaigns, and they were remarkably successful. By the end of the war, at least six ironclad ships had been constructed through the efforts of various Ladies’ Gunboat Societies. One of these ships was the C.S.S. Georgia. Shortly afterwards, in March of 1862, a group of twenty-two Savannah women joined together to form the Ladies’ Gunboat Association. Half of the identified members were the wives of merchants, possibly indicating their motivation in constructing the ship may have been to break the U.S. blockade. The Ladies’ Gunboat Association of Savannah was successful in raising over $115,000 for their ship, entirely through the donations of Georgia citizens. After extensive debate, they decided to call their ship the Georgia after her home state in hopes that she would protect the Georgia coast. Though the members had hoped to name her ten guns after female campaign contributors, there were too many names submitted, and the guns were unfortunately named after Georgia cities. The C.S.S. Georgia was originally intended to be an ironclad gunship, but there was no one involved in her construction with enough experience to build a strong enough engine for that type of ship. Therefore, she was downgraded during construction to a floating battery because the final engine was not able to power through the strong tides of the Savannah River. Due to a shortage of iron for armor, the Georgia’s wooden casemate was covered with overlapping rails from train tracks. Once completed, she was anchored near Mackey’s Point and remained in that location until Savannah was captured in 1864. The Confederate Ironclad Ram ‘Georgia,’ Frank Leslie’s Illustrated, December 27, 1862. From the U.S. Naval Historical Center Photograph Collection, NH 58722. The completion of the C.S.S. Georgia marked a turning point in the Civil War near Savannah. Though she could not actively attack U.S. positions, soldiers feared her guns and avoided the Savannah River, choosing to focus on capturing Hilton Head and Charleston instead. Her presence created a static front and protected the city of Savannah. When Savannah was finally captured by land in December of 1864, she was scuttled by her crew so that she would not be taken by the invading forces. The C.S.S. Georgia remained where she had been sunk until a dredging crew struck the wreck in 1968. After some initial dives, little was done with the ship until a series of dives in the 1980s, which brought up two of her cannons and many other artifacts. During this time, the wreck was accepted into a National Registry of Historic Places. Public interest in the C.S.S. Georgia was waning until recently, when plans were made to bring up large sections pending a major dredging project of the Savannah River. The ship’s historic significance made it necessary to recover as much as possible before dredging could begin in that part of the Savannah River. Several pieces were brought up in November of 2013 with major recovery efforts set to begin in 2014 in order to coincide with the 150th anniversary of the end of the Civil War. However, the project has been significantly delayed and developers have yet to set a new date. Jordan, Michael. “C.S.S. Georgia: ‘…To A Sailor’s Eye A Monstrous Creature…’” Master’s thesis, Armstrong State University, 2006. Swanson, Mark, and Robert Holcombe. C.S.S. Georgia Archival Study. Stone Mountain: New South Associates, 2007. The Civil War in Georgia. “Recovering the C.S.S. Georgia: Work Progresses to Raise the Ironclad in Savannah.” Accessed September 15, 2014. http://www.gacivilwar.org/story/recovering-the-css-georgia. Vandergriff, Cara. “’Petticoat Gunboats’: The Wartime Expansion of Confederate Women’s Discursive Opportunities Through Ladies’ Gunboat Societies.” Master’s thesis, University of Tennessee, 2013.